I'm linking up with Kacey at Doodle Bugs Teaching to share 5 things from this week! This one was a surprising hit this week! I wrote the sight words on the back of these foam easter eggs and set them out on a table with the recording sheet. 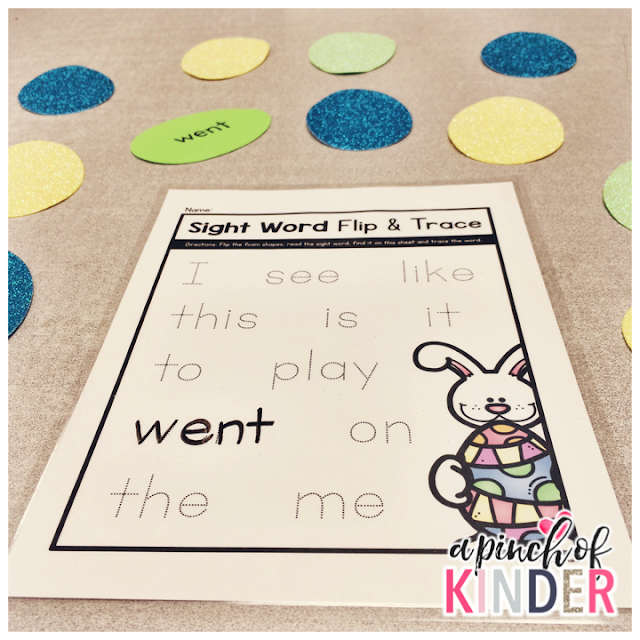 The kids flip the easter egg, read the sight word, find it on their sheet and trace it. They keep going until they trace all the words on the page. I got the foam eggs from the Dollar Tree! I have some foam bunnies as well so I think I might have to make a second version for next week! If you would like the recording sheet click here or on the image below to download it for free! I found these cute self-inking stamps at Dollarama last weekend and had to have them! 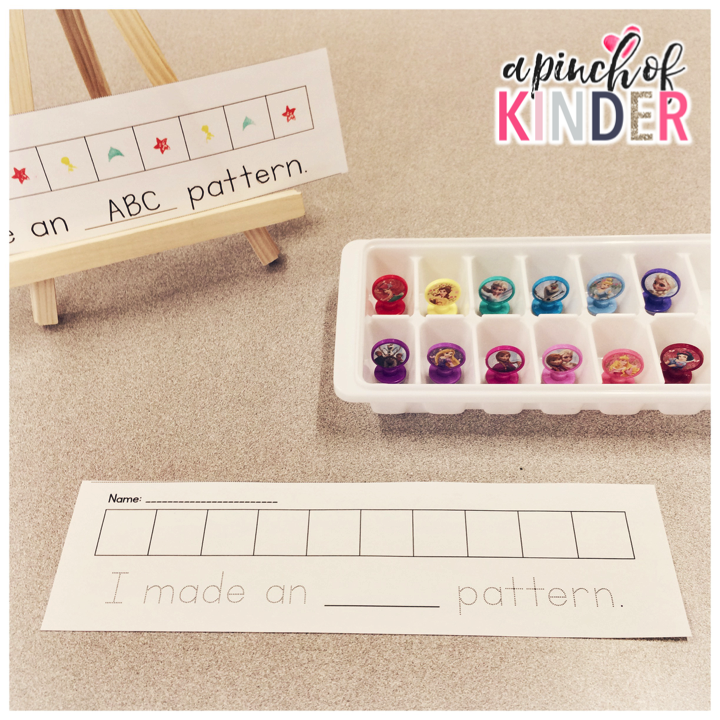 I have so many ideas for ways to use them but for this week I set them out with this patterning recording sheet and had the kids stamp patterns. They did so well with this and it was a HUGE hit! You can download the recording sheet that I used by clicking here or on the image below. 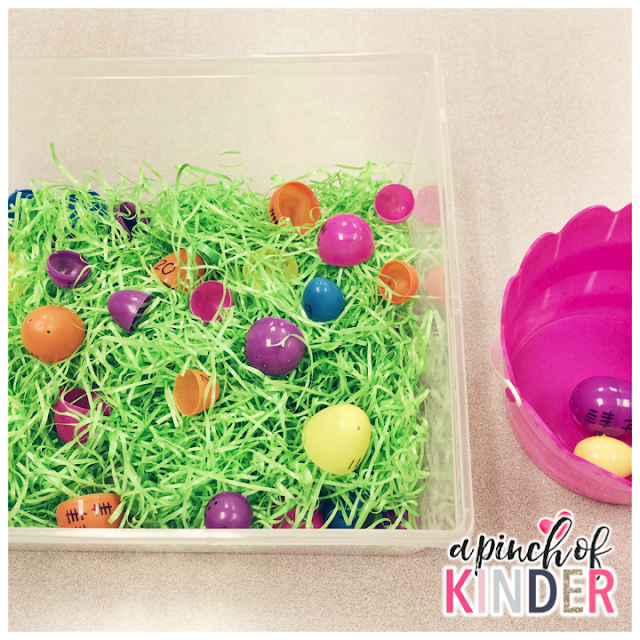 I love creating centres with Easter eggs! There are so many things you can do! I needed a quick math centre so I just wrote the number 1-10 with a sharpie on the top half of the egg and dots to match the number on the bottom. Then I wrote the numbers 11-20 on the top half of the egg and tallies to match on the bottom. The kids had fun "hunting" for the eggs and matching them! A couple weeks ago a student brought me a book from his book box and asked me if we could make the game in the book. Ever since we did that activity kids have been coming up to me with different books and ideas for games and centres for our classroom. 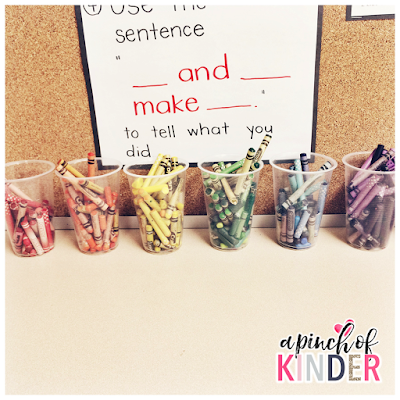 I love that they are pursuing their interests so I try to create or co-create the activities as often as possible. This week a student brought the book pictured above, "Making a rabbit" and asked me if we could make a rabbit like the book. We never do pre-cut crafts like this but she is someone who is shy and never asks for anything so I wanted to make sure I showed her that I valued her initiative. I told the class that "Z" had come to me with this idea and I/we read the book together to learn the steps. Then we practiced retelling the steps and I told them about some small changes I made (e.g. instead of gluing the mouth on I told them we were going to just draw it on with a marker). The next day, I pre-cut the shapes except for the cuts on the whiskers and set it out in a tray with the book. 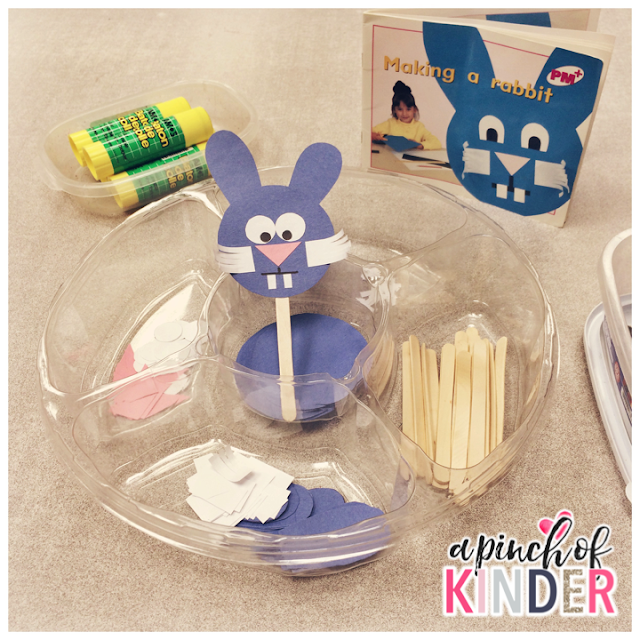 The kids had so much fun making the rabbits and it was a nice tie in with the Easter bunny that they had been excitedly talking about all week! 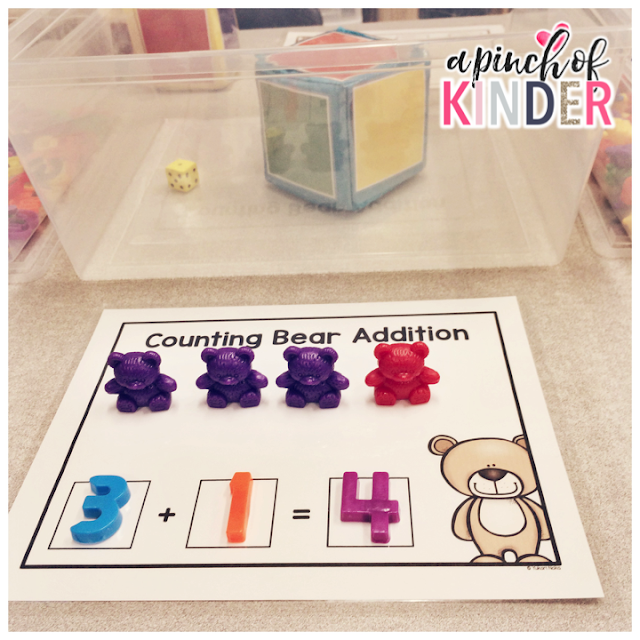 We're wrapping up addition and used this "Counting Bear Addition" as a centre and as a summative assessment. To play the students will roll the colour dice and the number dice into the bin. Then they put that many bears of that colour on their mat. Then they roll the 2 dice again and put that many bears of that colour on the mat. Then they write or build the number sentence at the bottom. 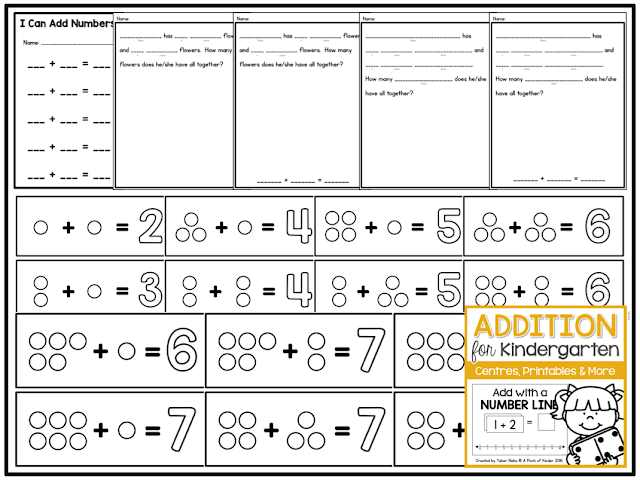 This printable is part of my "Add It Up!" unit on TPT. You can click here or on the image below to check it out. 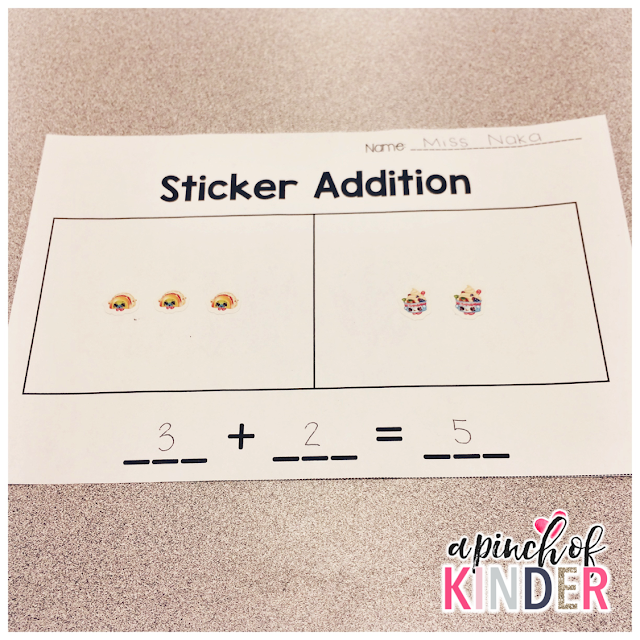 I recently wrote a blog post all about how I taught addition this year. You can check that out if you are interested by clicking here. That's it from me! I hope you have a great (hopefully long) weekend! Wow the year is flying by! 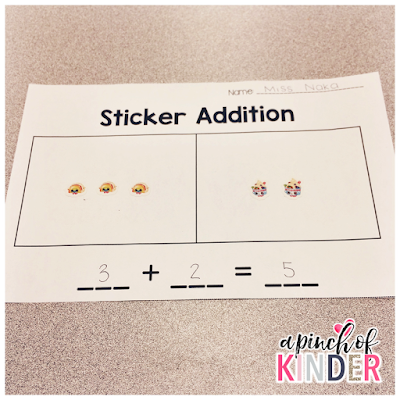 I can't believe we are working on addition already! 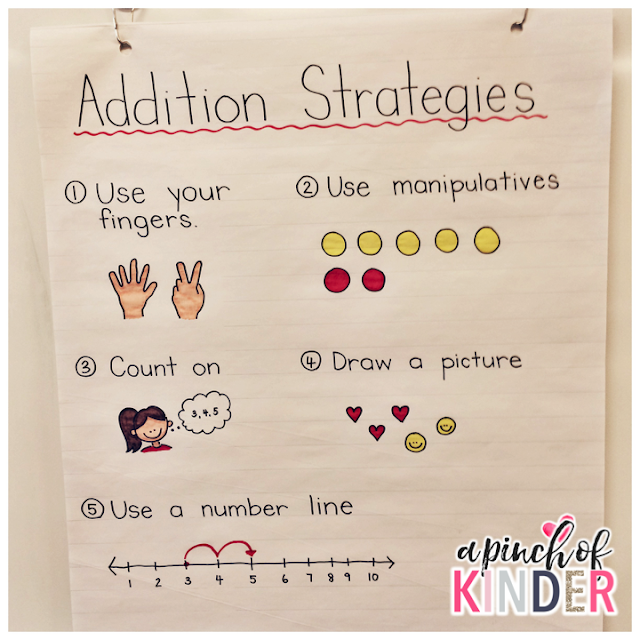 Read on to grab some ideas for teaching addition! 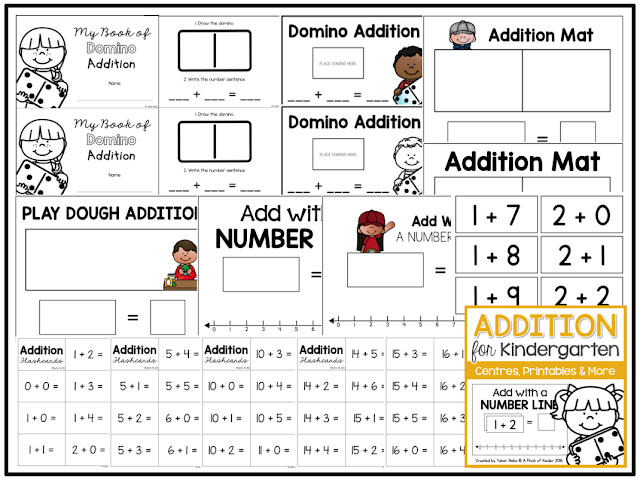 On the first day I just introduce addition and tell them that addition is like composing numbers, we just use different symbols. Instead of using "and" and "make" we use "+" and "=". On the second day we go over the learning goal and success criteria. 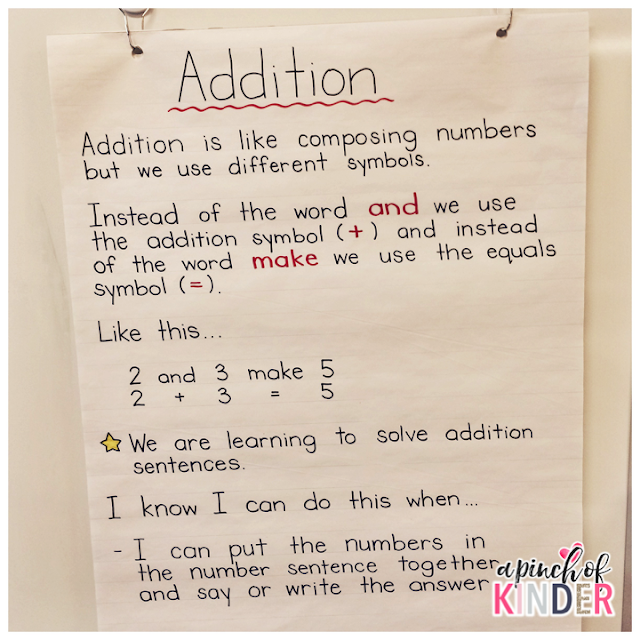 The learning goal is "we are learning to solve addition sentences" and the success criteria is "I know I can do this when I can put the numbers in the number sentence together and say or write the answer." Then we play the game "Collect & Add". 1. Have the students sit in a circle and put 2 hoola hoops in the middle. 2. Write an addition sentence frame ( ___ + ___ = ___ ) on chart paper or on the whiteboard. 3. Tell students that you will pick 2 students at a time to collect as many Easter eggs as they can within a set amount of time (start small, like 10 seconds). 4. Demonstrate first with a partner (your ECE, EA or a responsible student if you are on your own). First assign each person a hoola hoop. Press start on the timer and demonstrate how to go and find an egg, bring it back and put it into your hoola hoop. You may want to go over some rules such as walking feet only, you can only retrieve 1 egg at a time etc. 5. Keep collecting until the timer rings. When the timer rings have both players come back to the carpet. Count all the eggs in the first hoola hoop. Write the number in the addition sentence frame. 6. Count all the eggs in the second hoola hoop. Write the number in the addition sentence frame. 6. Solve the addition sentence by counting all the eggs. 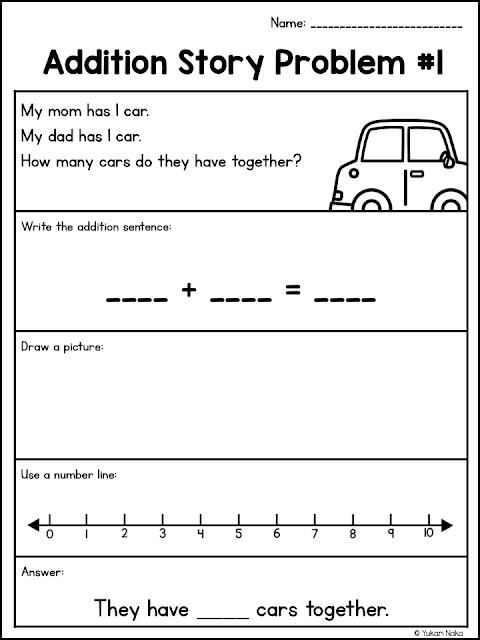 Write the answer in the addition sentence frame. Make the time on the timer longer each time so that the equations get harder. On the third day we play the "Collect & Add" game again as it's always a popular game and the kids often want a turn if they hadn't gotten one yet! 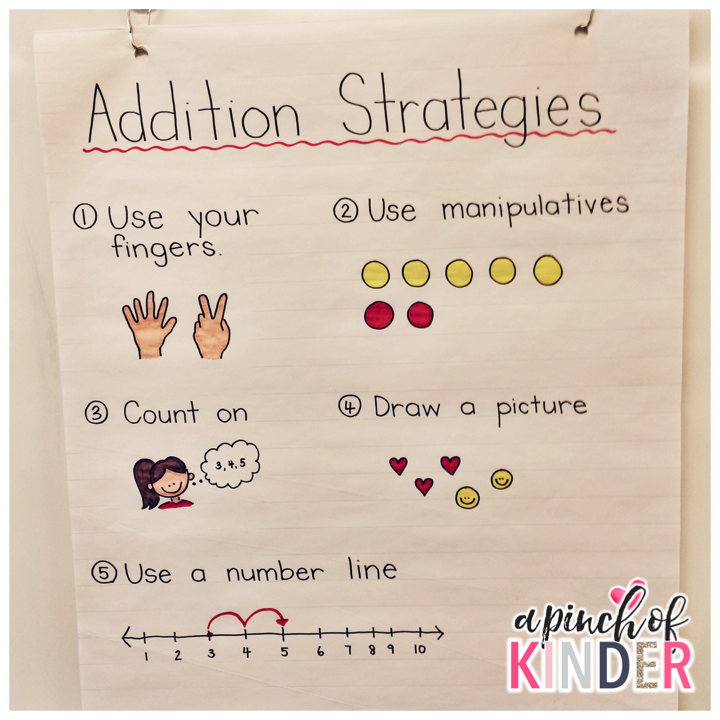 On the fourth day we start talking about addition strategies. I introduce all five strategies but we focus on "use your fingers" first. I tell them that we can solve addition problems by using our fingers. 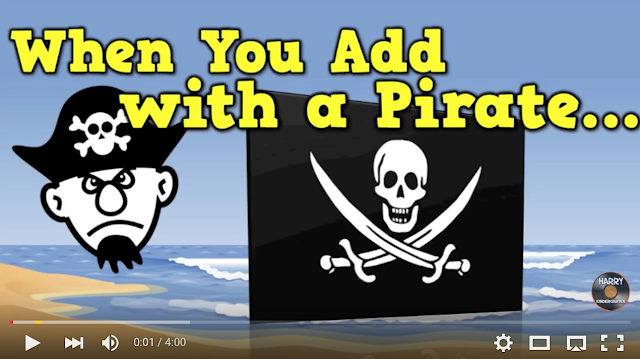 Then we watch "When You Add With a Pirate" by Harry Kindergarten. I model how to use fingers as the pirates read their addition stories and prompt the kids to follow along and practice too. Next we talk about the strategy "count on". We talk about how sometimes we won't have enough fingers to solve an addition question and "count on" is a strategy we can use. 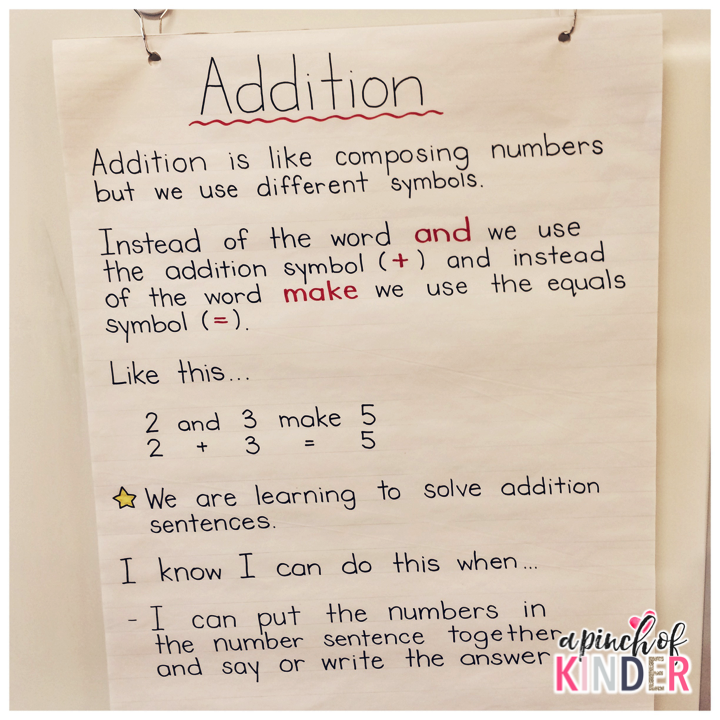 I write some addition sentences that have a sum between 11-15. Then I model how to "count on" by putting the bigger number in my head and then holding up the number I'm going to add on and counting up. We practice this together a few times to get use to it. Next we practice the strategy "use manipulatives". First we talk about different manipulative we could use for addition in our classroom. Some common suggestions are snap cubes, counting bears and linking chains. Then, I have the kids sit in a circle and pull out the big foam dice. Then I have a student come and roll the die and build the number with snap cubes. Then I have a second student come and roll the die and build the number with snap cubes. Then we write the addition sentence, put all the cubes together, count the cubes and write the answer. We repeat as time allows to practice. Next we practice the strategy "draw a picture". I write this question on the board. ____ has 2 dogs. ____ has 3 cats. How many animals do they have all together? Then I demonstrate how to draw a picture to show this problem. I draw 2 dogs and 3 cats and then we touch and count each animal to figure out how many animals there are all together. Next we practice the strategy "use a number line". First I write a number sentence on the board. Then I show them how to put a dot on the first number on the number line (the 5) then to hop 2 spots to the left to get the answer. We practice this a few times with different equations. On the last day we review all 5 strategies. ____ has 4 toys and ____ has 6 toys. How many toys do they have all together? (Again I use names of the kids in our class for the blanks). Then I ask them "how can we solve this addition problem?" I have them give me the first solution. Then I ask them if anyone can think of a different way. I try to keep going until we talk about all or almost all of the strategies. Of course we practice, practice, practice during centre time too! 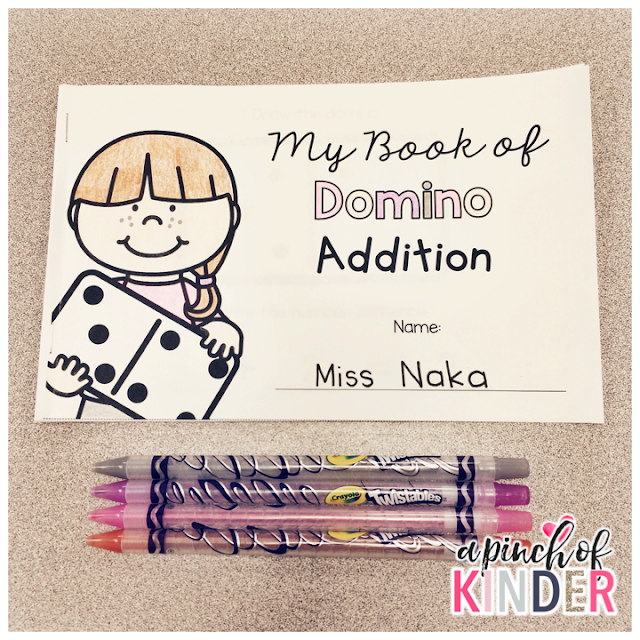 I set out this booklet with a basket of dominos. 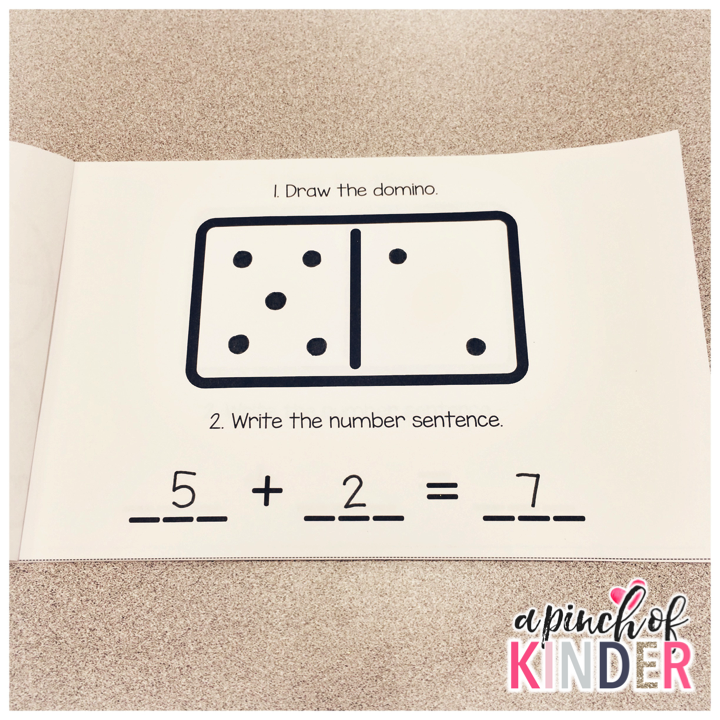 I have the kids pick a domino, copy the domino onto the booklet and then write the number sentence to match. 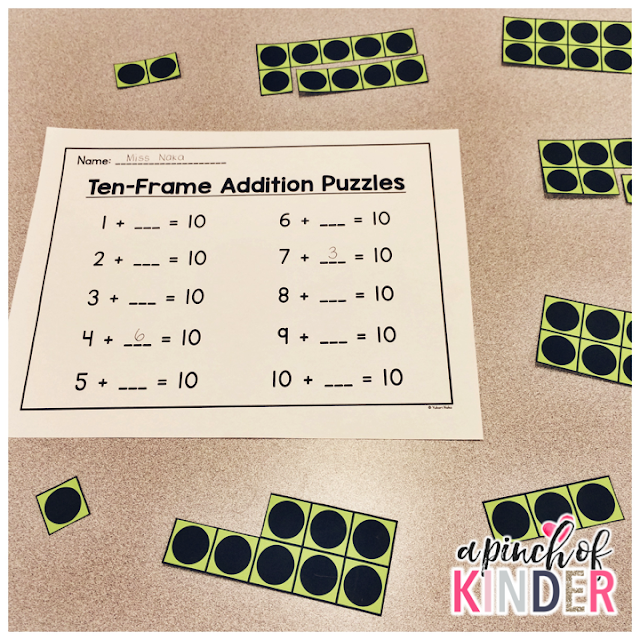 Students match the puzzle pieces to complete the ten-frames and record the addition number sentences. This one is ALWAYS a huge hit! The kids put some stickers in each square and then add the two sides together and complete the addition sentence. 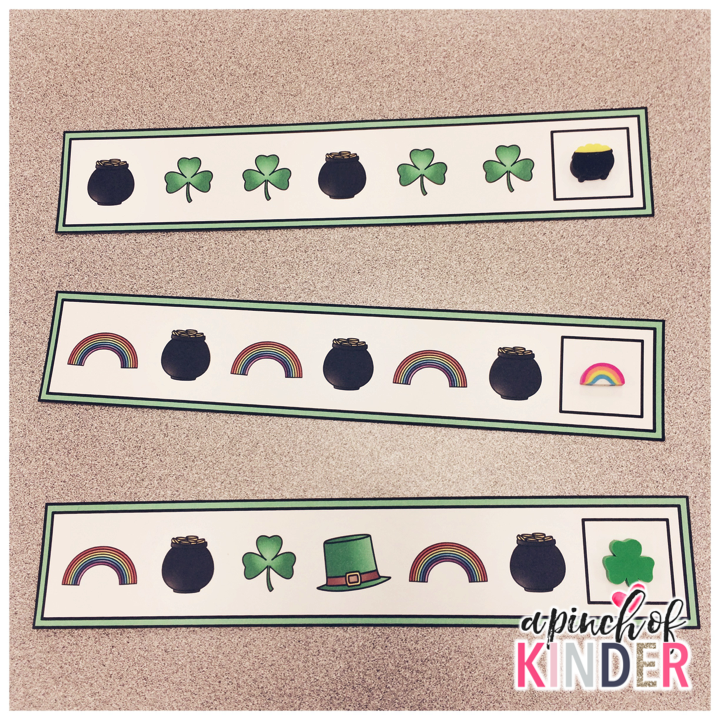 Small stickers work best for this activity! At this centre students will take turns rolling 2 dice and colouring the sum. If they roll a sum that is already coloured, they lose a turn. The first person to colour in all of the numbers is the winner! We practice these whole group first and some of my higher kids do them independently. I have the students roll the colour dice and the regular dice into the bin and build that many bears of that colour on the mat. Then they roll again and build the second number in the second colour. Then they add the 2 colours together and show me the corresponding number sentence. I set out both expo markers and magnets so that the kids could choose to build or write the numbers. 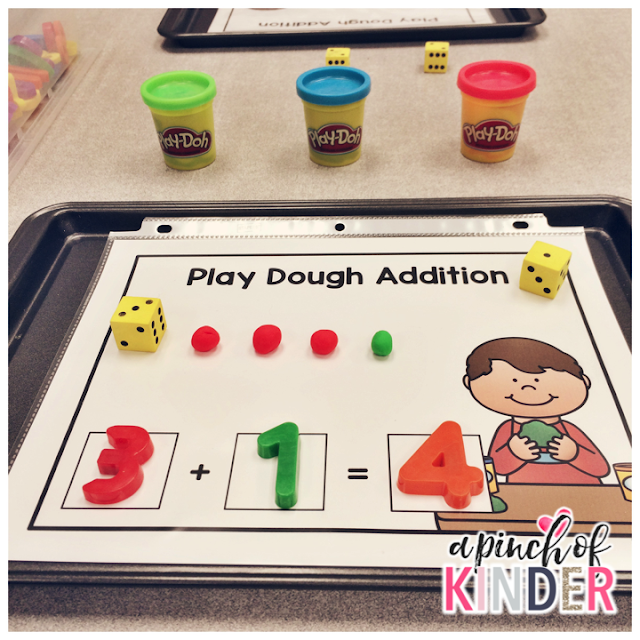 This one is similar to the counting bear addition, but with play dough! I set out 2 dice per sheet and at least 2 different colours of play dough. 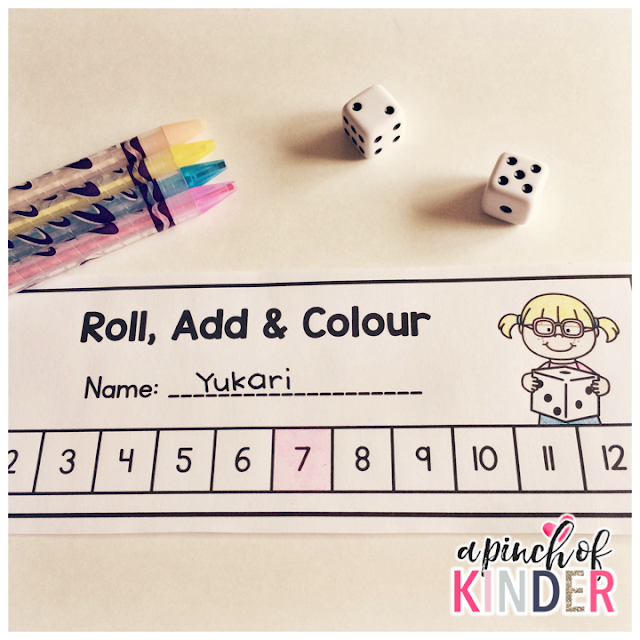 I have the kids roll the dice and build the 2 numbers in different colours. Then they show me how many play dough balls they have all together by completing the number sentence. 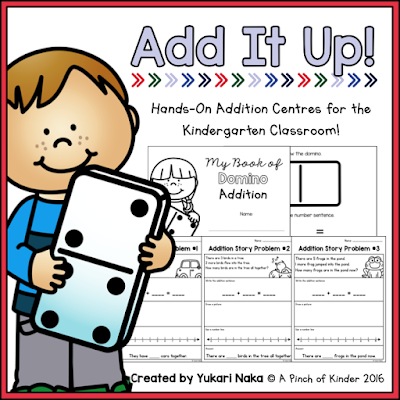 The centres you see in this blog post can be found in my addition unit on TPT. You can click here or on the images below to check it out! I hope you were able to grab some ideas for teaching addition! 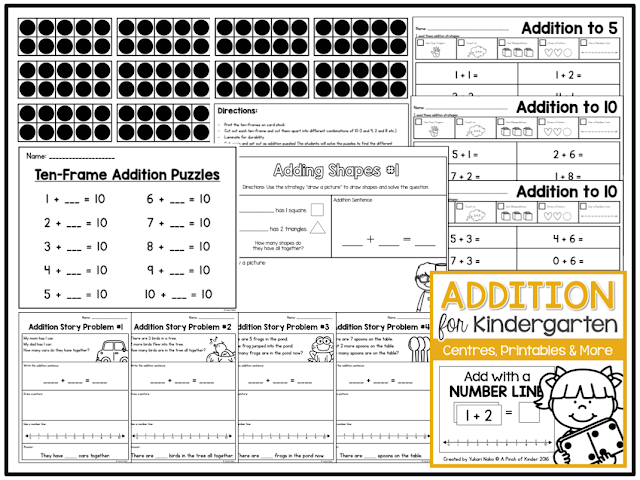 What fun activities do you plan when you teach addition? 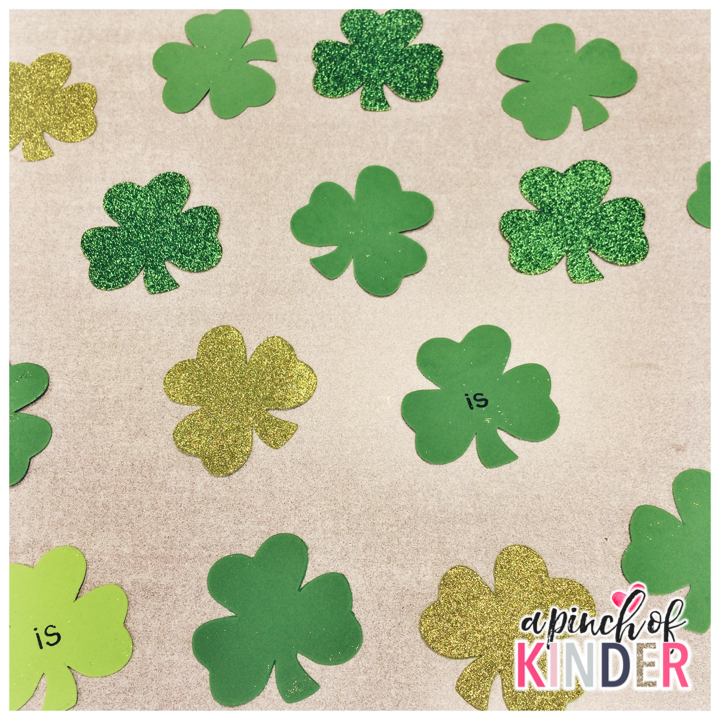 I'm sharing some fun, hands-on St. Patrick's Day themed activities today! I hope you can use them in the upcoming weeks! I threw in multi coloured magnetic letters (lowercase a-z) into a bin filled with black beans and had the students find and trace the letter with the colour of the magnet. 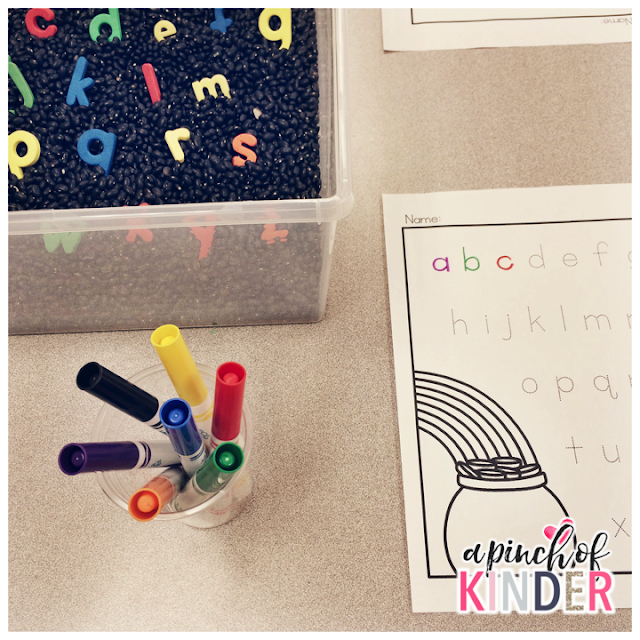 My kids need lower case letter printing practice so this was a fun and fresh way to practice! 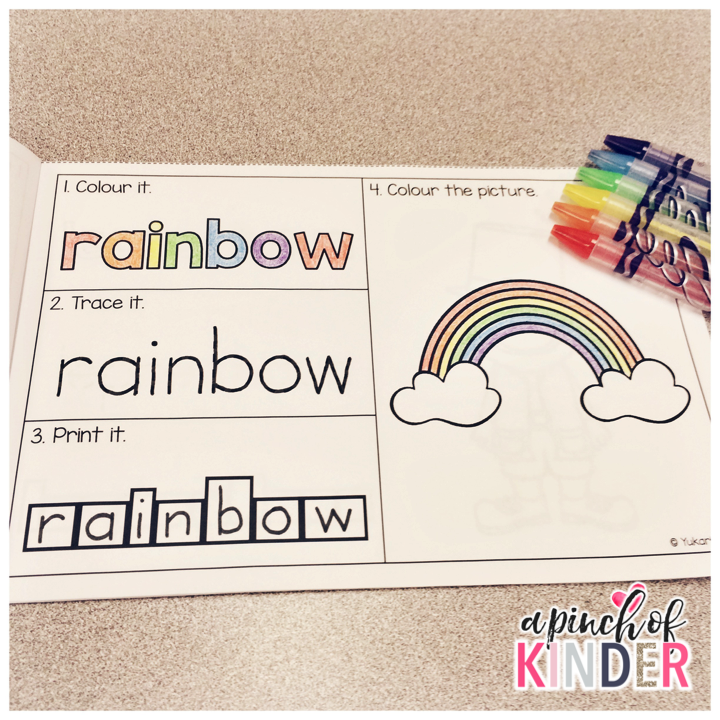 If you would like to try this activity out, you can download the tracing page printable that you see in the picture above by clicking on the image below! I found these foam shamrocks at the Dollar Tree. I just wrote sight words on one side and the kids played sight word memory with them! 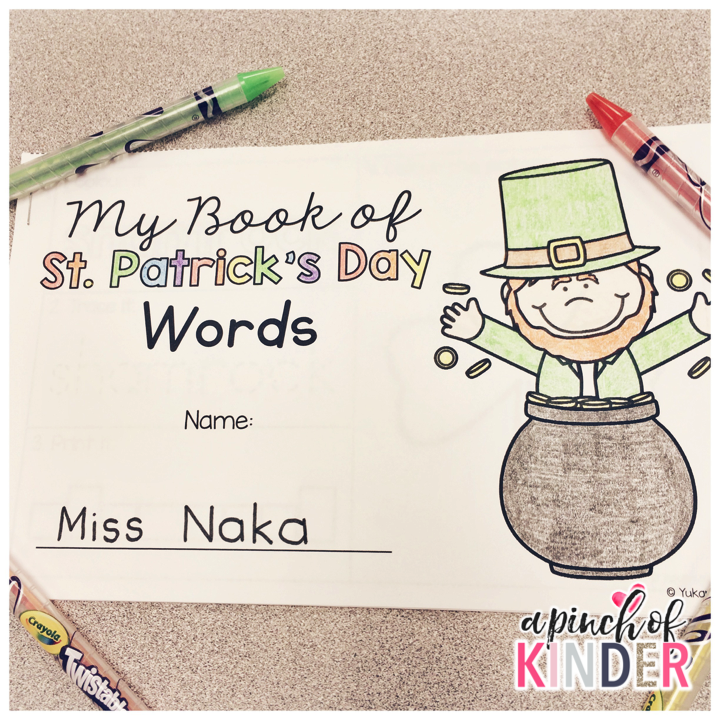 This little booklet was a hit around Valentine's Day so I decided to make a St. Patrick's Day version! 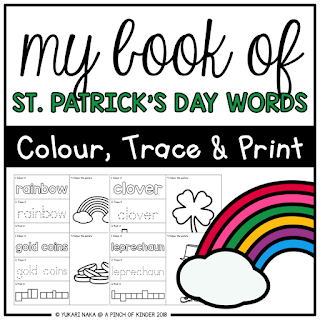 The words included are shamrock, rainbow, leprechaun, gold coins and horseshoe. For each word the kids colour the word, trace the word, print the word and colour the corresponding picture. This booklet is available separately here or by clicking on the image below. You can also buy it in a bundle by clicking here. I spray painted some plastic magnetic letters gold and threw them in with some coloured rice to give the CVC centre a new twist! The kids pull out a letter and match it to the correct CVC card. 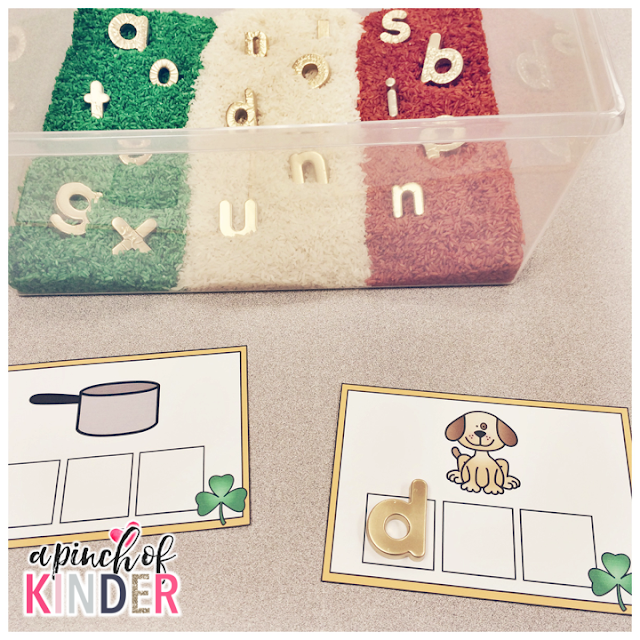 Perfect to practice stretching and hearing sounds in words! I tried these for the first time last week and they were a hit! 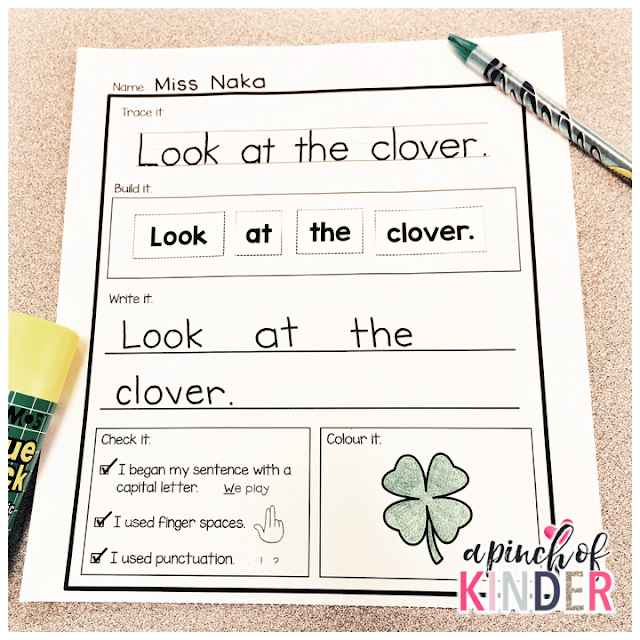 The kids are asked to trace the sentence; cut the bottom of the paper, cut out the boxes and glue it in the correct order, check their sentence wit the mini writing checklist and colour the corresponding picture. 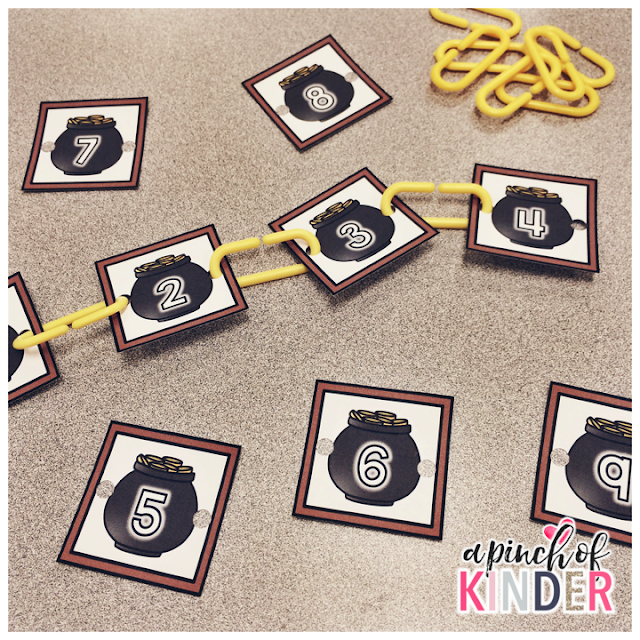 I hole punched the sides of these cards and the kids practiced putting numbers in order from 1-10 or 1-20 with linking chains. 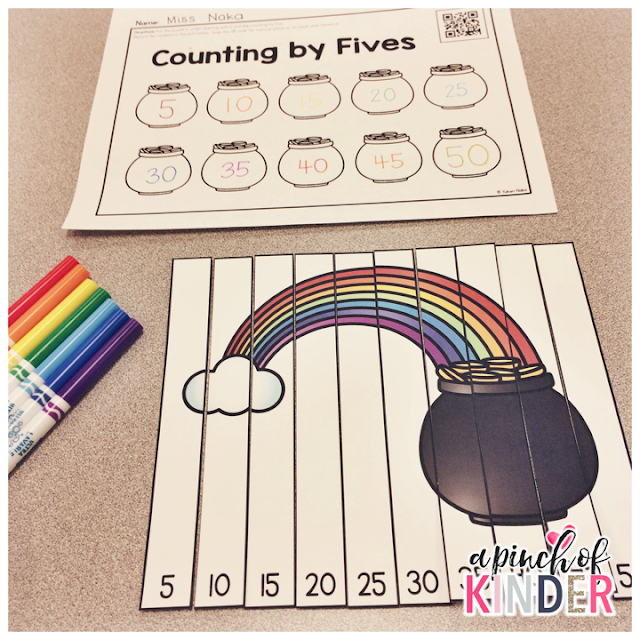 We just wrapped up skip counting and the majority of my kids still need more practice with counting by 5 so I made this skip counting puzzle and corresponding recording sheet. The QR code at the top of the recording sheet takes the kids to "The Counting by Fives Song" by Scratch Garden on YouTube. 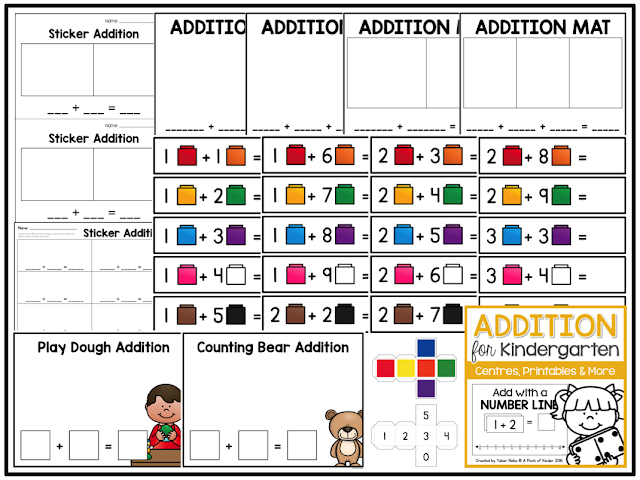 This allows the kids to practice skip-counting by 5 before they start the activity or self-check at the end. All of the printables shown above (except for "My Book of St. Patrick's Day Words") are in my "Kindergarten St. Patrick's Day Activities" pack on TPT. You can click here or on the image below to check it out. 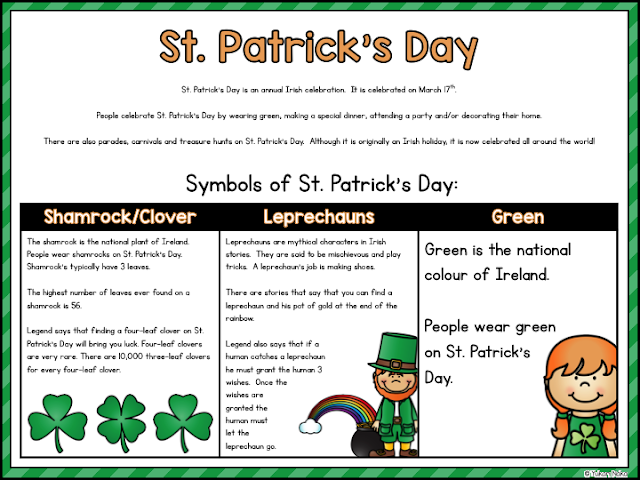 I read this info sheet to the kids to help build background knowledge about St. Patrick's Day when we first start talking about it. You can put it up on your SMARTBoard or use a projector to project it on a screen. Click on the image below to download it for free! I'm linking up with Farley at Oh Boy It's Farley for her monthly currently link-up! 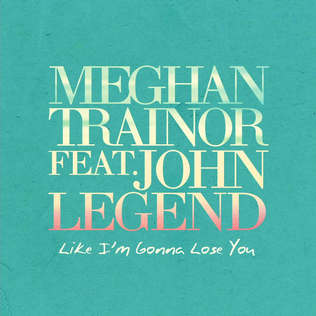 This is my current favourite song! If you haven't heard it yet you can check it out on YouTube by clicking here. Last month we sorted the crayons into these clear cups instead of having bins of crayons with random colours. 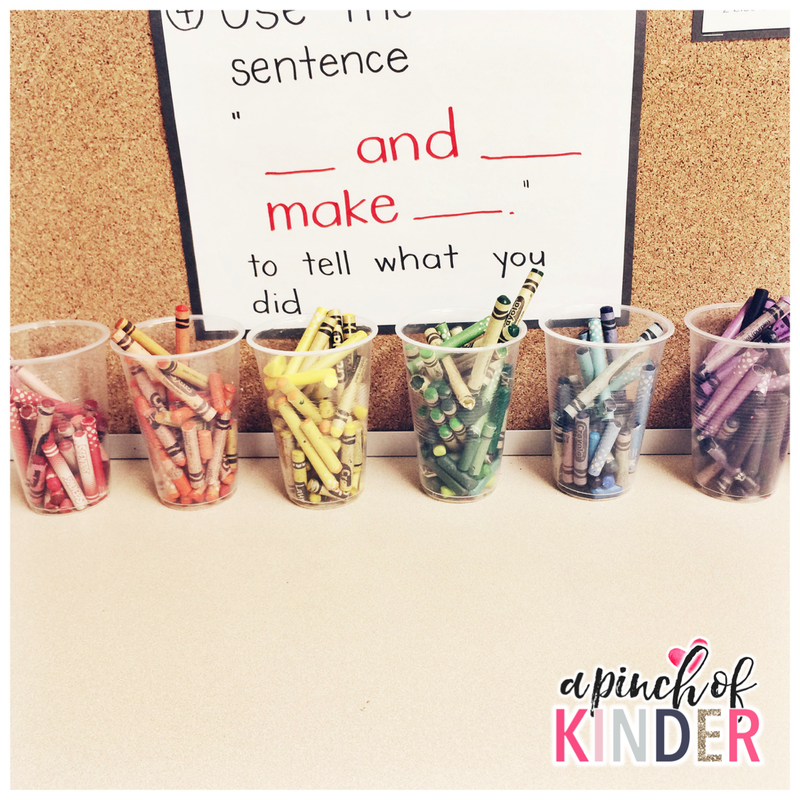 I have a few kids who scribble and are just plain lazy but this new system has really helped them stop and think about the colours they need for their picture rather than just grabbing the closest thing in the crayon bin! They are only allowed to take one crayon at a time and they have done a great job keeping them sorted too. Apart from the colours you see above I also have cups for pink, metallics, skin tones, brown, black, grey and white. Until I was making my March calendar a couple days ago I totally forgot that March break was in.. well.. MARCH! And with Easter being in March this year we barely have any teaching days this month! Crazy. 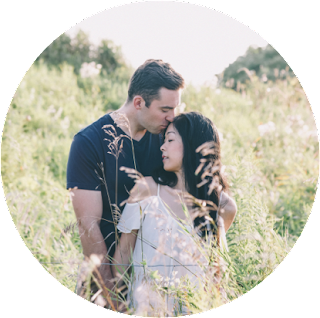 I'm dying to write more blog posts but I just haven't had the time to take and edit the pictures I need for them! 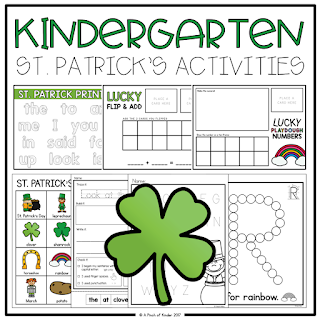 I have blog post ideas lined up for St. Patrick's Day activities, composing numbers, addition and problem-solving. I'm hoping to get a couple written this weekend and over March break! We are knee deep in addition right now in math. I have a higher group academically this year and I don't have too many resources for addition or subtraction (which we'll be moving on to soon). I'm going to try to work on a couple things this weekend but here is an activity that is always a hit! I made up a quick recording sheet this morning so that we could do this activity this afternoon. Anyone else's kids obsessed with Shopkins? 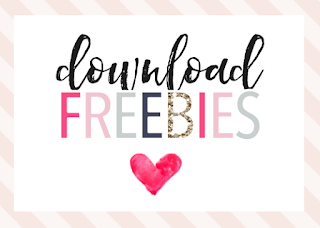 You can download this printable for free by clicking on the image below! Farley wanted to know if our school was used as a polling site. It is and it's a regular work day. 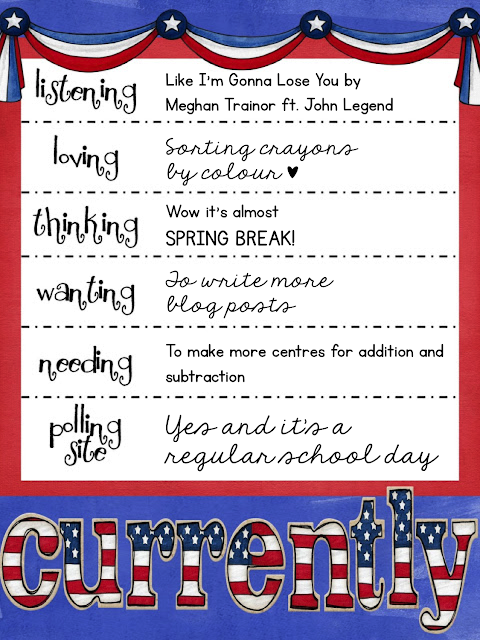 I have read on some other blogs that it's a teacher work day for some schools! That's it! Hop over to Farley's blog to link up too!